One of the many goals of The European Space Agency is to inspire and recruit the brightest and most knowledgeable youth in Europe and to make them go for a career within space research and space utilisation. They are wanted and specifically sought out to participate in small projects where the students can come up with ideas, develop and build a scientific payload, launch the payload and finally interpret the result and provide a final report. One of these campaigns is “Fly a Rocket”, another is CanSat. This year’s Fly a Rocket campaign is offered due to an agreement between the ESA Education office, the Norwegian Center for Space-related Education (NAROM), and the Norwegian Space Center (Norsk Romsenter). 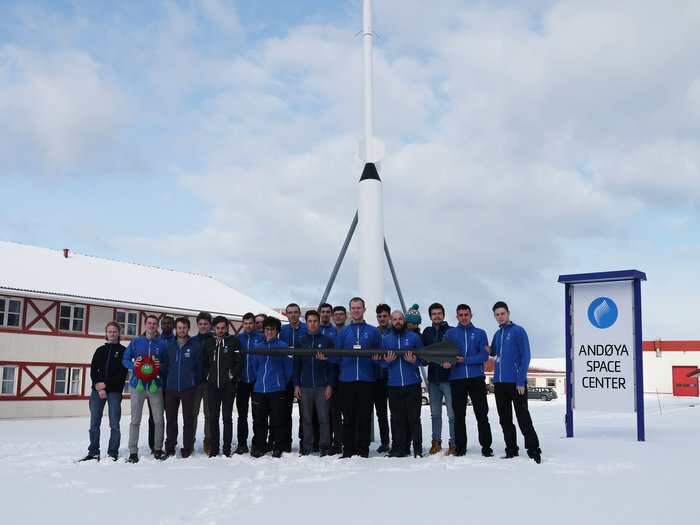 The payloads will be launched from Andøya Space Center in the Northern Norway in April 2019, thus, the selected participants only have six months to develop their ideas for the scientific payload. After a successful pilot cycle with the launch of a rocket from Andøya in 2016/2017, the ESA Education office is now searching for 24 new, enthusiastic, future space scientists/engineers to participate in the next cycle of this exciting programme. All the pilot cycle students with the NAROM rocket. Photo credit: ESA. ESA is seeking students in the early phase of the education process. At present, the focus has been to look for individualists. The hope is to find good candidates with a good mix of girls and boys, spread all over Europe. Through web-based dissertations, the best candidates will be selected and form a group aimed at developing a scientific project from idea to the process of interpreting the results. The Fly a Rocket programme also provides the selected candidates a chance to learn more about space science and technology, and to launch their very own student rocket from the Andoya launch area. Throughout the winter of 2018/19 the selected candidates will participate in an online course to inform and prepare them for a rocket campaign at the space centre, scheduled for April 2019. During the campaign the participants will build, verify and launch their own rocket, as well as attending several lectures and tours and learning more about European and Norwegian efforts in space. The unique opportunity is aimed at bachelors level students early in their studies and will give them an introduction into space science and technology, ‘filling the gap’ between secondary school activities, such as CANSats, also launched from Andøya, and more advanced programmes such as REXUS/BEXUS, launched from Esrange in the northern Sweden. ESA hopes that participation in this programme will elevate participants’ understanding and appreciation for the space industry and encourage them to pursue further opportunities within their studies or careers related to space. While an understanding of some higher-level mathematics is required, candidates need not necessarily be from an aerospace background. However, they should show and demonstrate a strong interest in the space industry, space science or technology. ESA Education recently announced that the European CanSat Competition is opened. Teams made up of 4 to 6 secondary school students aged 14-20, from ESA Member and Associate Member States are invited to participate. The 1st ranked team of each of the national competitions, along with the teams selected directly by ESA, will participate in the European Launch Campaign, which will take place from 24 to 28 June 2019. The location of the European CanSat competition will be announced later. The European CanSat Competiton is an ESA educational project aiming to promote STEM literacy amongst young European students through project-based learning. The team’s challenge is to fit all the subsystems of a satellite inside a soft drink can! Every participating CanSat team will have to accomplish two missions: a mandatory primary mission, requiring collecting and transmitting air temperature and pressure data at least once a second by means of radio waves, and a secondary mission completely open to your imagination. Their secondary mission could be exploring a new planet, analysing earth’s atmosphere or developing a rover to fit inside the CanSat, or anything they may devise. Featured image: Launch of a sond rocket from Andøya Space Center. Photo credit: Andøya Space Center.